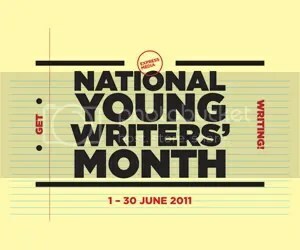 Yep, National Young Writers’ Month is up and happening, online and off. We have badges (see, I’ve already put mine on). I have a piece up on the NYWM blog that I like to call ‘Why I (Don’t) Write’. And we have heaps of other good stuff goin’ on, on the blog, on the forum, on Twitter and on Facebook. Not to mention we ambassadors and our impending travels around our respective states and territories, and the workshops, and who knows what else. One way to find out: get amongst! Anyway, I hope to still make time to keep blogging here over the next two months, but I may be overly engaged with NYWM, along with my other online writing project (and one of my NYWM goals), SuFaJ, which I hope to reveal soon. Acronyms and excitement all around! This entry was posted in On Writing, Plugs and tagged awesome, blogging, blogs, NaYoWriMo, NYWM, SuFaJ, writing.